The NHL will have a fresh look for the regular season and a new format for the Stanley Cup Playoffs beginning next season after the Board of Governors approved the realignment plan proposed last week. The four-division plan, featuring a new set-up for the playoffs, will be in place for a minimum of three seasons, barring any franchise relocation or expansion. NHL Commissioner Gary Bettman said neither relocation nor expansion were being discussed, however. "This goes into the good news category," Commissioner Bettman said Thursday. "We can begin the process of preparing next year's schedule." 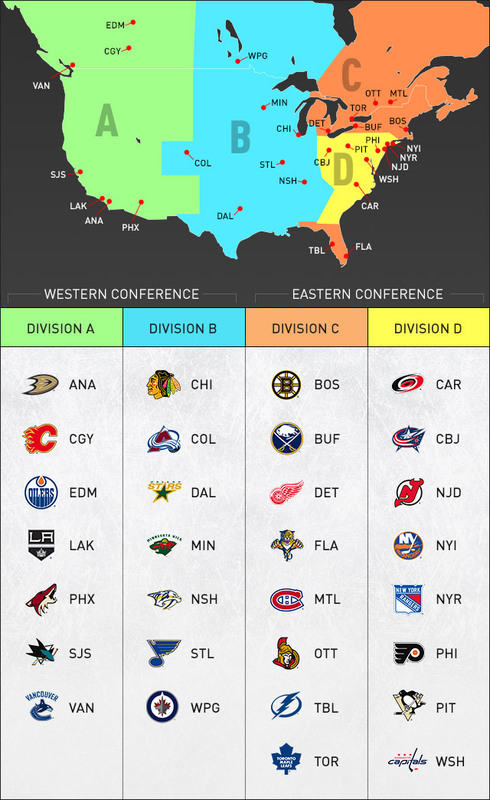 The NHL and NHL Players' Association each had input into the plan to realign the League into a more geographically appropriate two-conference, four-division format that has 16 teams in the Eastern Conference and 14 teams in the Western Conference. The Detroit Red Wings and Columbus Blue Jackets are moving to the Eastern Conference to provide them the ability to play the majority of their games against teams in the same time zone. The Winnipeg Jets are moving to the Western Conference for the same reason. "I think it's very exciting for us as an organization and for our fans to be geographically located where we ought to be," Jets chairman Mark Chipman said. "It looks like from a League perspective [realignment] solved a lot of issues, so we're very supportive of it." The Dallas Stars are staying in the Western Conference but moving into a division that includes five other teams from the Central time zone. Stars president and CEO Jim Lites said being in the same time zone as most of the teams in the division should have an impact on television ratings and fan interest. "We have noticed and have experienced since 1998, when we moved from the Central (Division) at that time to the Pacific, our television ratings have dropped by a good number, 60 percent on the average," Lites said. "When we play consistently in prime (time) our numbers go up by a factor of something like four or five times. It's just natural. Central time zone starts at 7 p.m. [are] typically in people's television-watching habits, and trying to start games at 9 or 9:30 p.m. just limits the amount of people that are going to watch. It changes your narrative. People lose touch with you when you're on a three-game swing to the West. You may go a week and people will not have watched. "So we're thrilled to be able to get back to it, and we just believe and know our broadcast partners, our corporate partners, and certainly our fans are excited at the prospect of having the vast majority of our games, particularly games of significance, division games, being played in prime [time]. It's really important to us." The new alignment also ensures that all 30 teams play in all 30 arenas at least once per season. Detroit general manager Ken Holland said that will be a way for the Red Wings to preserve some of the rivalries they have developed with Western Conference teams. "One of the things that was really important to us was a matrix that had a home-and-home with every team in the other conference," Holland said. "So, even though we're heading East, we're still thrilled that we're going to play all the teams in the Western Conference home-and-home." The Stanley Cup Playoffs will still consist of 16 teams, eight in each conference, but it will be division-based and a wild-card system has been added. The seeding of the wild-card teams within each divisional playoff will be determined on the basis of regular-season points. The division winner with the most points in the conference will be matched against the wild-card team with the fewest points; the division winner with the second-most points in the conference will play the wild-card team with the second fewest points. The winners of the conference championships advance to the Stanley Cup Final. "We tend to use common sense around here and this seems to make a lot of common sense," Columbus president John Davidson said. "When you get out the ledger sheet and you go pros and cons, I don't think there is anything on the negative side," he added. The divisions will be temporarily referred to as Division A, Division B, Division C and Division D. Permanent names will be assigned later. The Western Conference will house Division A and Division B (each a seven-team division), while Division C and D will consist of eight teams each and make up the Eastern Conference. Division A is the Anaheim Ducks, Calgary Flames, Edmonton Oilers, Los Angeles Kings, Phoenix Coyotes, San Jose Sharks and Vancouver Canucks. All the teams are from either the Pacific time zone or Mountain time zone. Division B features the Chicago Blackhawks, Colorado Avalanche, Dallas Stars, Minnesota Wild, Nashville Predators, St. Louis Blues and Winnipeg Jets. Colorado is the only Mountain time zone team; the rest are from the Central time zone. "It's much better for us," Stars defenseman Stephane Robidas said. "It's less travel, fewer trips out west -- the time zones, the amount of time you spend on the plane after games. You don't have to wait in [Los Angeles], you can come back after games. It's all little things in the long run I think will help our team." Division C has four Original Six franchises: the Boston Bruins, Detroit Red Wings, Montreal Canadiens and Toronto Maple Leafs. 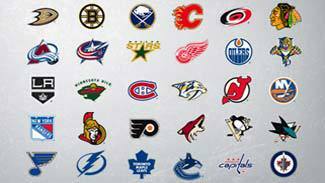 The Buffalo Sabres, Florida Panthers, Ottawa Senators and Tampa Bay Lightning are also in the division. Commissioner Bettman said he thinks being in this division will benefit the Panthers and Lighting despite the added travel. "From a business standpoint, I think this is probably really good for both Florida teams," he said. "Competitively they may have their own issues, travel-wise they may have issues, but based on where Florida is from a geographic standpoint whatever we did wasn't going to be perfect. "But our commitment in that regard is when we're doing the scheduling we're going to try and do the best possible job of focusing on the travel needs of the two Florida clubs and with respect to the teams in their division and their travel to and from Florida." The Columbus Blue Jackets, Carolina Hurricanes and Washington Capitals will join the New Jersey Devils, New York Islanders, New York Rangers, Philadelphia Flyers and Pittsburgh Penguins in Division D.
"It's going to be tough. There are a lot of good teams in there," Hurricanes coach Kirk Muller said. "There are a lot of grinding, physical teams, so it makes you sit back and evaluate your team and organization asking, are we the type of team that's skilled enough to go into certain arenas and get points, or do you want to change your style to match up with your opponents? "We're obviously in the hunt this year, but it will be something where you may have to sit back and look at everything and ask, where do you fit in with your opposition, and decide if you want to make changes or if you're comfortable with the group that you have." Commissioner Bettman stressed that the unbalanced format is not a concern. "Unless you were conducting the competition by flipping a coin through each matchup, the seventh and eighth teams, if you go back and look, are typically teams by the end of the regular season that are out of it anyway," he said. "So whether or not it's a seventh or eighth team, as a practical matter it doesn't make a whole lot of difference. Again, if you were doing a simple coin flip in between matchups then it would make a statistical difference, but as a practical matter we don't think it does. "Two, we introduced the wild card to try to balance that off a little bit better. So we think in that regard it begins to address what might be a concern, although as I indicated, I'm not sure it's that realistic of a concern." The NHLPA has given its consent to play under the new alignment and playoff system for a minimum of three seasons, through the 2015-16 NHL season. "I think the whole package that's put together with the relocation, the moves, the matrix, the playoff format -- it's an exciting time for the National Hockey League," Holland said.